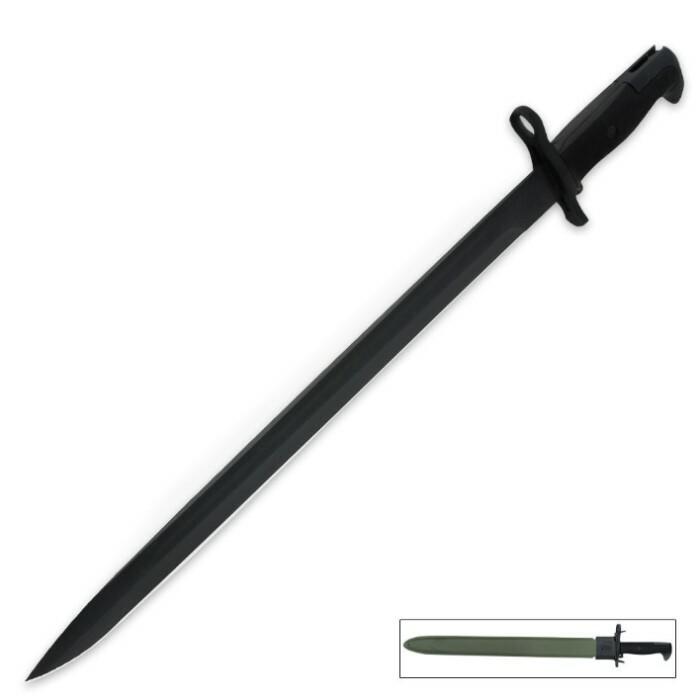 M1 Garand Bayonet Historical Replica - 21 3/4" | BUDK.com - Knives & Swords At The Lowest Prices! M1 Garand Bayonet Historical Replica - 21 3/4"
The legendary M1 Garand rifle once bore bayonets just like this historically faithful replica. It features a 16 1/8" black coated stainless steel blade and a textured handle for a slip-free grip. "US 1943" is delicately etched on the blade, and our historical reproduction includes a sturdy locking scabbard. 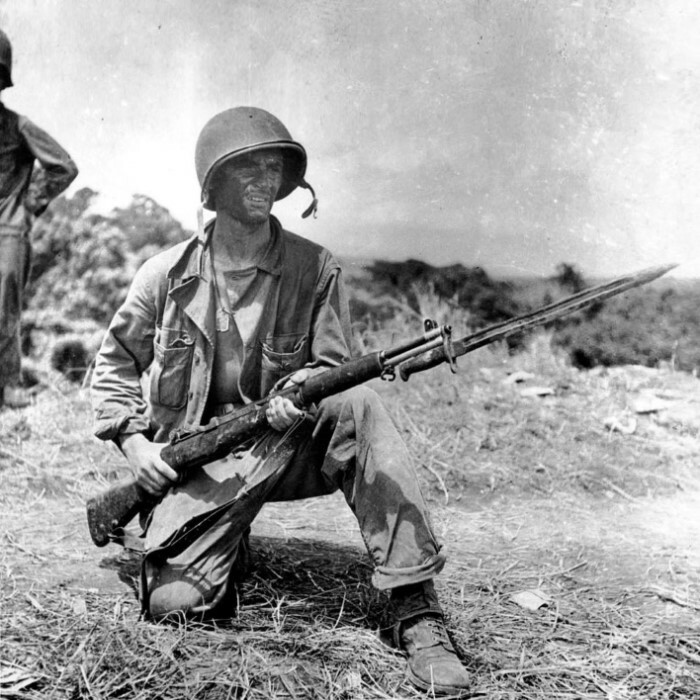 Called "the greatest battle implement ever devised" by General Patton, the M1 Garand officially replaced the M1903 Springfield as the standard service rifle of the US Armed Forces in 1936, becoming one of the most recognized pieces of military weaponry in history. The legendary M1 Garand was used exclusively by US forces in World War II and the Korean War, and to a lesser extent in the Vietnam War. Overall it's almost great. The annoying china mark isn't stamped in so it's easy to disguise. My only complaint was that it would not fit a rifle as is. A close inspection revealed a bulge in the casting deep in the lug slot was preventing it from going on all the way. The flaw is very difficult to get to even with swiss files. I don't know if the problem is just in my knife or if it's in the mold used to cast it but be prepared to either spend some time filing or send it back. If it were more expensive that would definitely a problem, but you don't expect perfection at this price. Very Nice! Been looking for a real one for some time with no luck. Then I found this one. At first it didn't want to fit my Garand but with a little tap from a dead blow hammer it slipped right on, I don't have my 03A3 at my house so I couldn't try that one out yet. I'm very happy and have told a several friends about getting one. I have own an original and this is spot on. I love it! Fits to the rifle. Don't like the "China" on it but what the heck! Can't have everything right? The rest is good right down to the scabbard. I expected a cheap imitation but received a very nice reproduction. 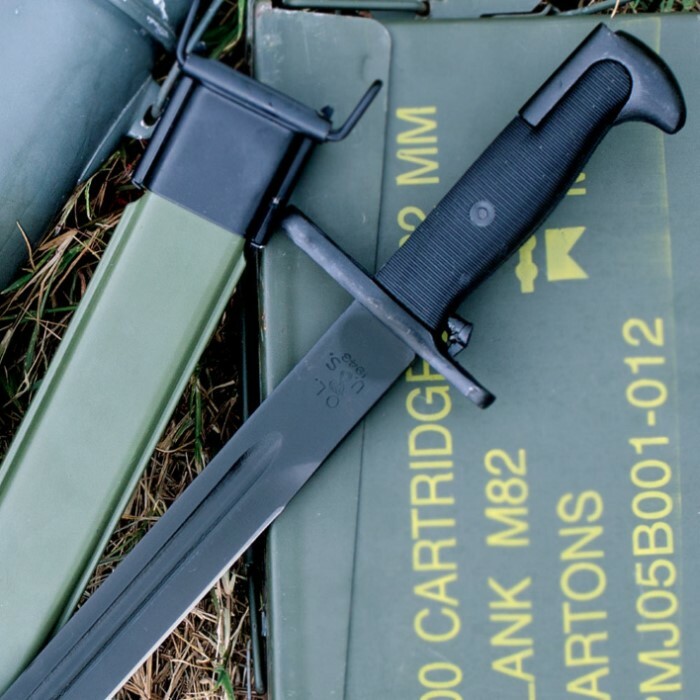 The bayonet looks and feels like the real thing. I definitely would recommend it to a friend. A great value and a nice, high quality reproduction. the first one I bought did not fit .there was weld slag in the mounting slot. the second one fit my m1 garand right. but wouldn't fit my springfeild03a3,had to open the slot with a small die grinder. You can't beat either length blade model for the price and they both fit the M1 Garand nicely. An original G.I. bayonet will also fit the scabbard.